I don't know about you but I really crave color this time of the year. When I look at my winter wardrobe, I see a lot of brown, grey, and black with a little bit of burgundy, teal green, or deep blue thrown in. These are the dark color of winter, and the majority of what the stores sell for these dreary months. So if your feeling the absence of color in your life, what can you do? Well, add color to your neutral outfit with accessories of course! This was a very boring, neutral outfit until I added a pop of color with my purse. I received this London Fog Orange/Coral/Red (I really have no idea what color it is) from my daughter for my birthday. I hadn't used it yet because I thought it was more appropriate for the spring/summer months when it would match my clothes more. But when I was about to leave my house and I automatically started to reach for my brown tote, I thought "Nah. There's enough brown in this outfit. Lets try a more colorful bag!" 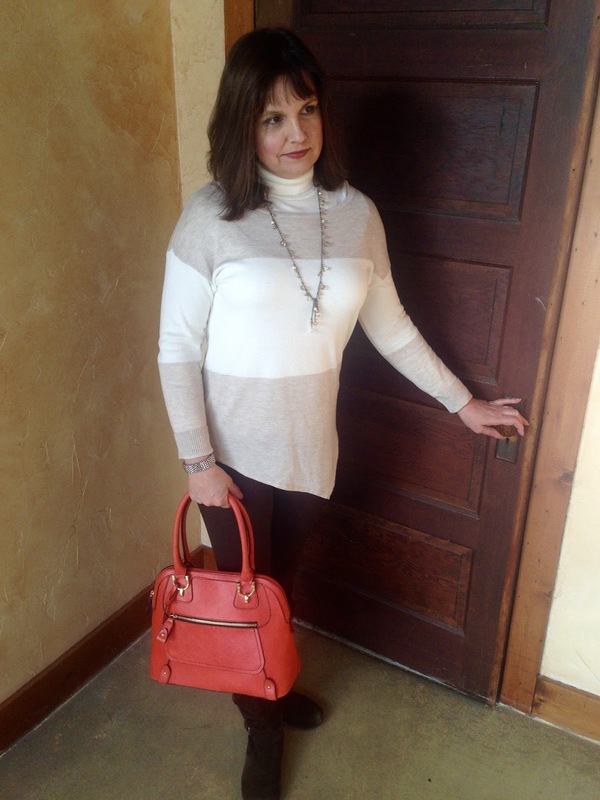 The orange tote really brought some much life into an otherwise dull outfit! It was 0 degrees when I left my house so I was dressed purely for warmth and comfort. 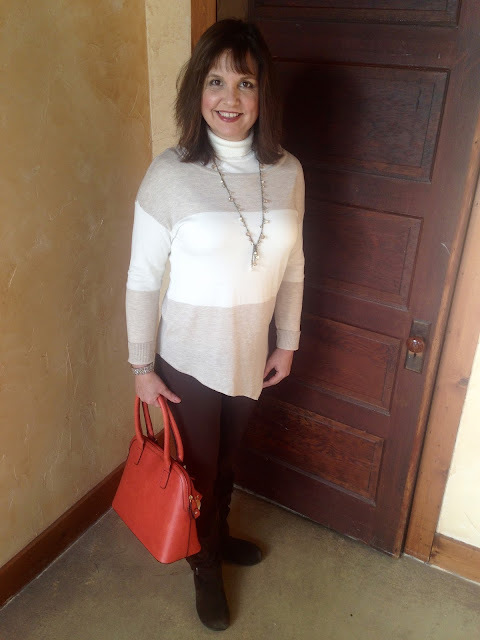 I put a cream colored turtleneck (old, Worthington) on under a striped asymmetrical long sweater (J.C. Penney ), brown leggings and socks (old), and brown suede and fur boots (old). The sweater is nice and long, so it's somewhat appropriate to wear with leggings. I say "somewhat" because I did have a small portion of my bottom showing where the top diagonals up. I wore this outfit to a casual music rehearsal. I wouldn't wear it for some other occasions for this reason. For jewelry, I chose a simple silver bracelet, and a long silver necklace with crystal and taupe clear beads. Here is a close up of this pretty structured London Fog bag. I'd love to hear your thoughts of what color you would call it. I knew I would be standing for hours at my musical practice, so I chose comfortable footwear. I picked these boots up while in Italy over six years ago, and I still have them! They are not practical for extreme cold weather and snow, but they are quite cozy in other winter conditions. 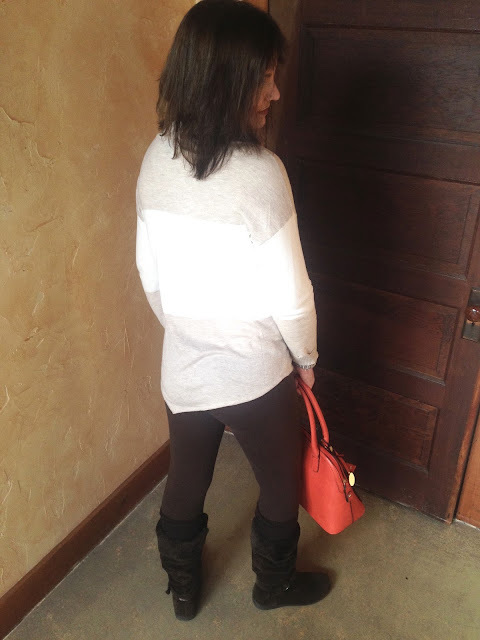 Here is the backside of my outfit...see my little bit of bum sticking out uncovered? I know, I've seen a lot worse, but I usually have my whole bottom covered (and front) covered when I wear leggings. I really like this sweater because of the asymmetrical cut and it is so comfortable, long, and thin. I think it fits well, but I'm not sure the wide stripes are very flattering for someone like me who is heavier on top than on the bottom. When I read the reviews on the JCP site, someone else agreed and said the top was not flattering for the curvier woman. I know stripes are all the rage in fashion right now, but I still have mixed feelings about them. And now, here are more ways to add color to your winter outfits from Pinterest! 1. Don't just add color with a handbag...wear colorful shoes too! 2. Add a pop of color around your face with a scarf! 3. Wear Bold Color Jewelry. This is a summer outfit, but a colorful necklace would work with neutral winter clothes as well. 4. Add color to your outfit with a bright winter coat! I have a bright red pea coat that I wear on warmer winter days that is so pretty and cheerful. So what about you? Do you like all the dark, neutral fashion colors of winter or are you craving some colors in your wardrobe? How do you like to add color to your neutral outfits? Pretty! I think a brightly colored bag is a great way to add color! I also just got a turquoise coat. Bright colors in winter can completely change our mood, can't they? 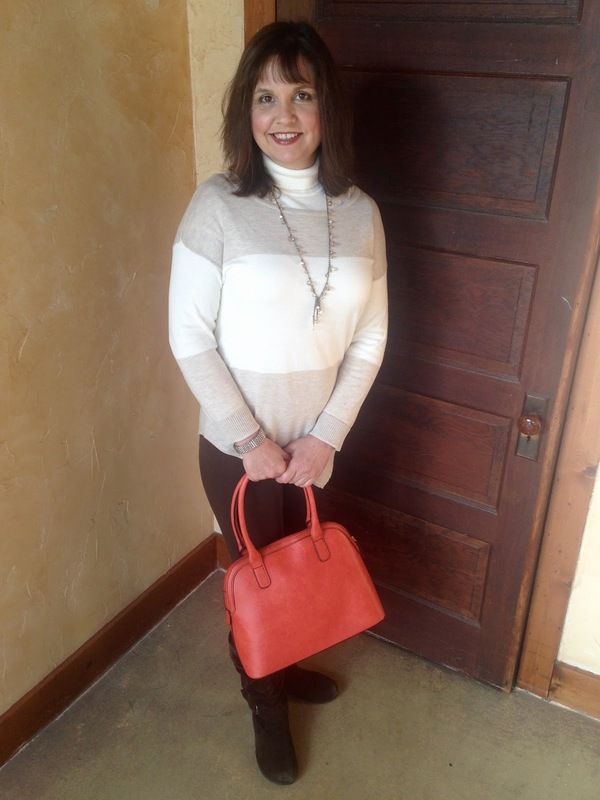 Handbags are a great way to add some color to a look! I always try to add different color schemes to make outfits less boring. The red bag - adds the perfect pop of color. Thanks for joining my link up. I hope you have a wonderful weekend. Olivia Palermo is one of my fashion icons - and I love her green coat! That red bag adds the perfect pop of color. Thanks for linking up. Olivia Palermo is my fashion icon - and I love her green coat. Such a pretty bag and it does add a nice pop of color!! I love the cut of your top, too! This bright orange bag is stunning! what a lovely, bold piece. First off, I love your new sweater and want it myself. I think that a bright coat, bright bag or bright scarf is how I add color to my outfits during Winter. Love that London Fog bag. Your daughter did so well. I have a Red MK leather tote which I love. 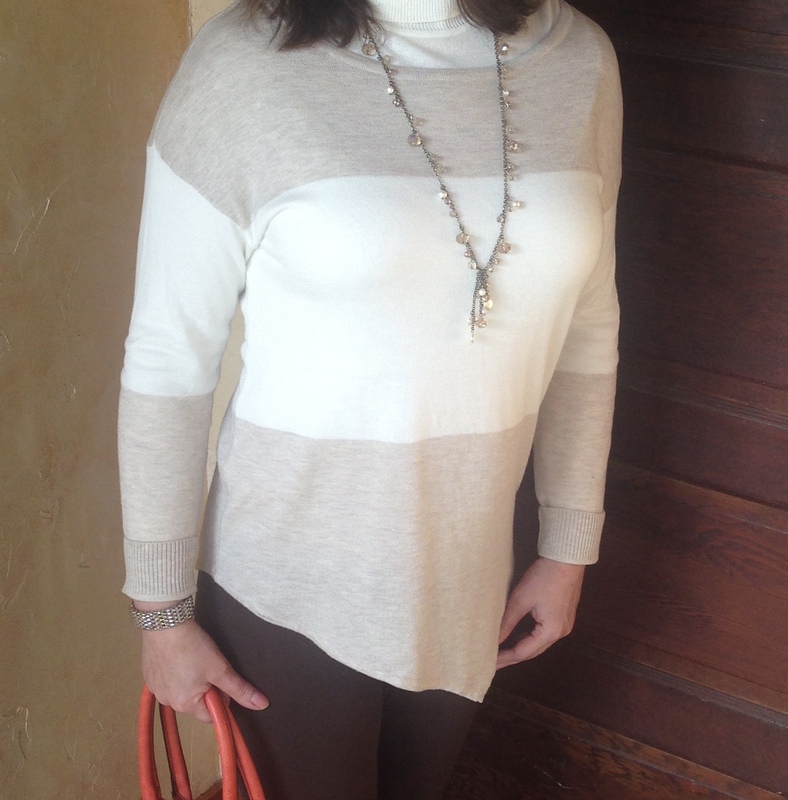 All I wear is neutrals, so a pop of color with a handbag, shoes, or scarf is a great idea! I love the color of your bag, and am loving the asymmetrical, stripe sweater.